Iron Man 2 had the fifth-highest opening weekend of all time! Enough about that…let’s talk about the women behind Iron Man. Naturally we’re starting with Gwyneth Paltrow. 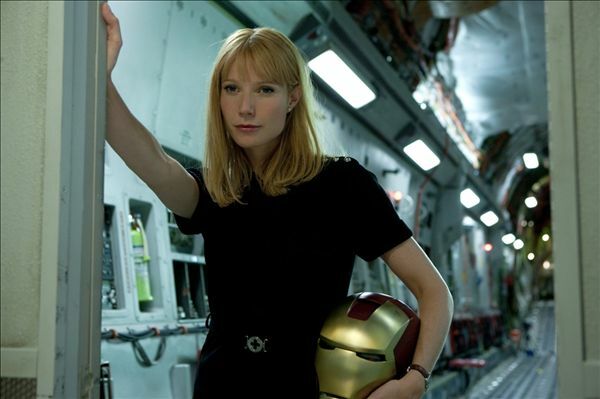 Her character Pepper doesn’t get to do much…Gwyneth says she would like to get more lines in Ironman 3. Despite the small role, fans are glad to see the actress play a charming girl-next-door type as opposed to a chilly beauty that she’s acted out before. Pepper’s hairstyle is do-able for real girls and women. The long bob is better known as a lob–a trend Ms. Paltrow helped start a couple of years ago. The look is very versatile, but Pepper tends to wear it down, up or in a ponytail. The ever-perky Pepper wears bangs and has her hair colored strawberry blond (or light red depending on the lighting). Scarlett Johansson goes in the opposite direction to tress up for her role, Natalie Rushman/Black Widow. The actress says the Black Widow is a “no-bullsh_t character.” Thick, dark red ringlets fit that image–controlled on top and wild below. A few layers and scrunch styling make the curls swing with her every move. Like Gwyneth, Leslie Bibbs has picked up where the first Iron Man left off with her Christine Everhart the reporter who has mixed feelings about Iron Man. Here, Leslie’s poses in a just-got-out-of-bed look, which reminds us of Christine’s night with Tony Stark before he came out as Iron Man. We really like Leslie’s uncomplicated style. It’s easy to do if you have long side bangs and light layers. Blow dry hair with a large brush, rolling ends under or up for a tousled look. Coming soon: more women behind Iron Man… like Kate Mara, Helena Mattson, Renee Herlocker, Grace Stanley, Olivia Munn, Anya Monzikoba and even more! This entry was posted in Movies, real hair, star hairstyles and tagged celebrity hairstyles, Gywneth Paltrow, Iron Man, Leslie Bibb, Robert Downey Jr., Scarlett Johansson. Bookmark the permalink.